Oh they're perfect. I haven't journeyed up to Crate & Barrel since it opened. Need to do that. I wish it was downtown! I do too! I do not like Yorkdale one little bit, although I find myself there way too often (my parents live nearby). i've been searching for years for the perfect cake stand! i've yet to fall in love completely, but this one is mighty sweet. so cute! you and that cakestand! if you got one you'd have to have a desert party to show it off. who doesn't like a desert party? oh yeah i like these because you can appreciate the ruffle more so than the kind that are flat, you know? i like how it has that edge. 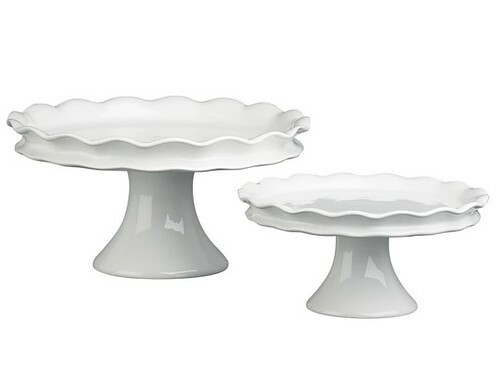 Potluck Studios also carries pretty ruffled cake stands — and they have a bunch of colors if you want to mix it up.